I’ve been a fan of several New Belgium beers (Trippel, Mothership Wit) in the past, so I was excited to see a pumpkin ale from this brewery. And I wasn’t disappointed. Out of the bottle, Pumpkick has a slightly hazy pumpkin-orange color with a delicate white foam. The aroma is sweet, hoppy, and rich with citrus and spices. And it just gets better with your first sip. This ale isn’t overly carbonated, which I appreciate in a pumpkin ale. 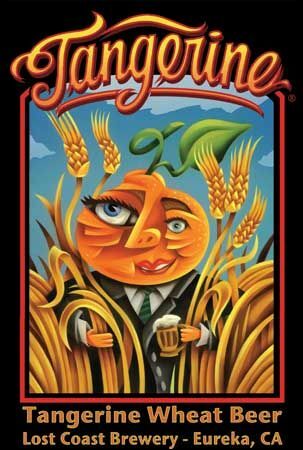 There’s a mild tartness from the cranberry, which is nice, but overall the pumpkin, cranberry, and spices blend together to create a truly smooth, refreshing, flavorful autumn ale. I’m impressed! New Belgium has knocked another out of the ball field! I was pleasantly surprised when I tried “regular” Shock Top in May 2011. I’m generally disappointed by the watery, flavorless concoctions produced by corporate brewers, but Shock Top—with a twist of orange—was a pleasant exception to the rule. So when I saw a display of Shock Top Pumpkin Wheat, I didn’t hesitate to place a six-pack in my shopping cart. Shock Top Pumpkin pours a nice pumpkin orange with a slight cream-colored head. Take a sniff and enjoy the scent of spices, caramel, and hops. Again, I was nicely surprised by this beer. 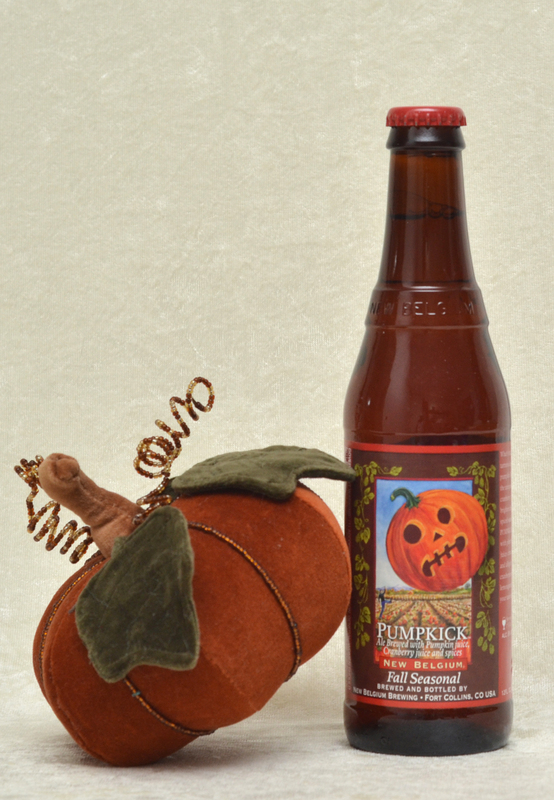 The Pumpkin Wheat delivers a full-body pumpkin/spice flavor that blends nicely with its hops and wheat base. No add-ons like a twist of orange needed…I noticed a slight pumpkin flavor that admittedly did get overpowered by the taste of orange. I detected no bitterness and no bad aftertaste from my first sip to my last. 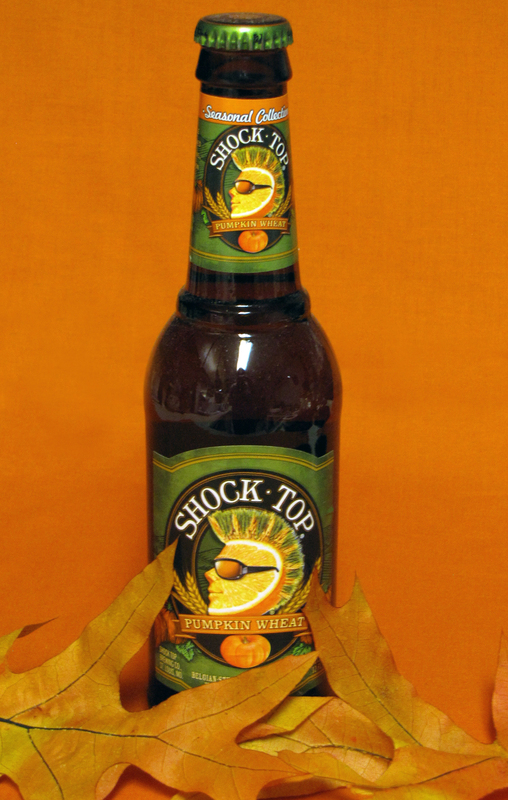 I’m picky about my pumpkin and Oktoberfest beers, so with that in mind, I’m declaring Shock Top Pumpkin a winner! I’ll definitely buy it again. Every year, I’m noticing new entrants on the Oktoberfest/autumn/pumpkin beer scene, which makes my heart sing but also requires me to make some choices where before that wasn’t required. 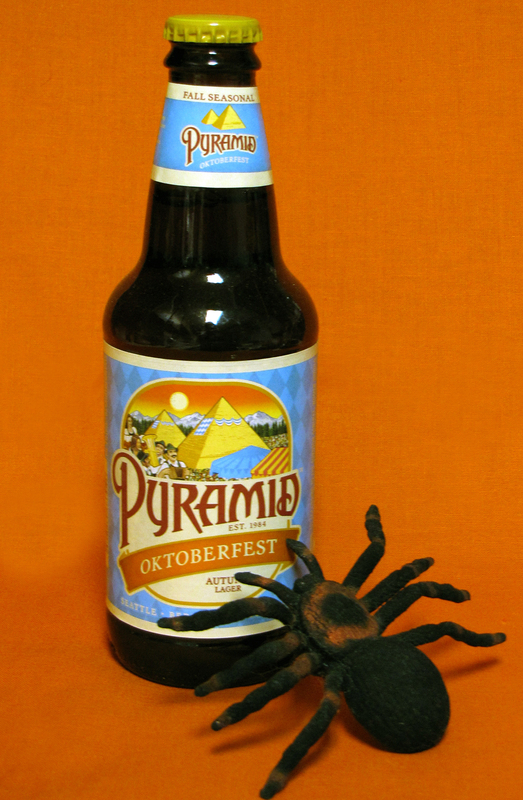 Pyramid Oktoberfest was one I hadn’t tried before, so into the shopping cart it went. Pyramid pours a nice caramel color with decent lacing. There’s plenty of carbonation. I could smell some spices blended with a nice hop aroma. Unfortunately, what I mostly tasted on first sip was bitterness. About halfway through the bottle, I began to taste more of the biscuity, malty flavors and spice, which were nice. I would have enjoyed a bit more body to it, less bitterness, and more caramel flavoring, though I found the spice balance just right. Overall, a decent Oktoberfest, but not the pick of the ever-growing litter. 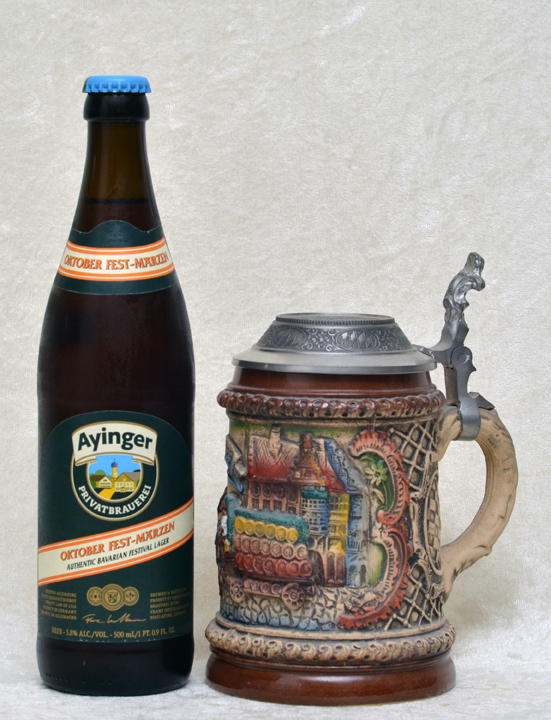 …It’s time for Oktoberfest and pumpkin beers! I’ve been sampling several these past three weeks and will have new reviews posted soon! In the meantime, grab a six-pack and enjoy! Banana Bread poured a nice golden amber with slight foam that melted away quickly. It smelled of nuts and bananas and spices. 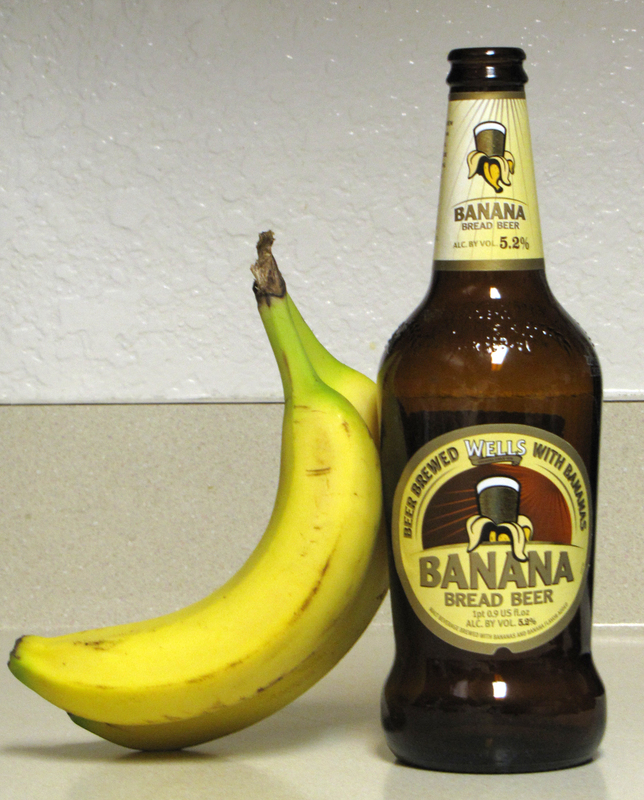 My first mouthful tasted bitter, like they had used the inner peel of the banana to brew the beer. After several swallows, I warmed up to it a bit and enjoyed the malty, banana flavors and hints of yeast and hops. The carbonation was spot on. This wasn’t a bad beer, but it wasn’t a fabulous one, either. I would certainly drink it again but wouldn’t go out of my way for it, especially with the far-superior Ayinger Ur-Weisse just up the street at BevMo. 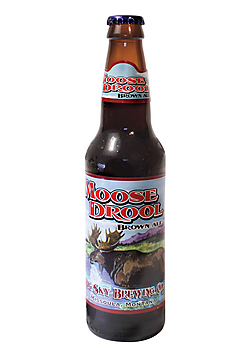 When you’re staying at an inn inside a national park and you see an ale called “Moose Drool” on the drink menu, well, there’s only one thing to do: try it! At Mt. Rainier’s National Park Inn, you can sit on the front porch of the hotel, your trail-sore feet propped up on the railing, surrounded by nature and a glorious view of the grand mountain across the valley, and order drinks off the menu, which are then delivered cold with a chilled glass. Again, I found myself in a familiar situation: was I grading the beer on its taste or on the experience surrounding it? It wasn’t easy, but I dialed down my euphoria for a few moments to give this beer its true day in court. Moose Drool poured a medium brown that almost looked like blackberry at times. It had nice lacing and carbonation and sported a full, hearty taste without being overwhelming. I tasted some nice malts and caramel flavoring with a touch of nuttiness, all well balanced and not overly sweet. Take away the mountains, the forest, the song of birds and rustle of leaves, and this beer would still score high with me. And that’s a good thing, because I plan to drink it again, and unfortunately, the next time will probably be within the city limits. September has been brutal in San Diego: temperatures in the 90s and 100s, alternating between tropical rainforest humid and desert dry. When I saw a six-pack of Tangerine Wheat Ale on sale at Ralph’s, I thought that sounded like a nice, light, fruity beer that would put a cold kibosh on the murderous heat. And I was right. Let me preface this by saying that it wasn’t love at first taste. My initial reaction to the first sip was that the tangerine flavor was delightful, but the ale behind it was weak. Still, not a bad summer beer. Subsequent bottles have made this beer grow on me. Served cold, really cold on a blistering summer day, this beer is like a liquid oasis. The spicy, fruity tangerine and cold, mellow ale flavoring mixed with the chill of the fridge will make you feel civilized again. It’s a different beer with a unique flavor, and I’ll definitely buy it again. With trepidation, I tried my first pumpkin ale at a brew pub in downtown Knoxville, Tennessee, in October 1994. The combination of pumpkin and beer sounded like the stuff nightmares are made of to me. But I was hooked on my first sip and have since developed a Pavlov’s dogs’ response to the words “pumpkin ale.” So when I heard a six-pack of Blue Moon Pumpkin Ale calling me from the beer cooler at Vons, I answered the siren song with relish. The ale poured a deep copper with a slight frothy head. The aroma of spices and wheat swirled inside my nose, and I anticipated that first mouthful of pumpkin wonder with delight. But…no pumpkin. Now, I’m not saying this is a bad beer, because it isn’t. 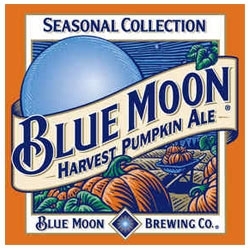 Blue Moon did a good job with the spices and wheat—they’re just right—but I couldn’t for the life of me taste the pumpkin. This aspect of Blue Moon Harvest Pumpkin Ale was a disappointment; however, I did enjoy the beer itself. It was tasty and refreshing with just the right carbonation. I would recommend relabeling this ale as an Oktoberfest and keeping it as is. If it wants to be a true pumpkin ale, I’m going to have to taste more than allspice and nutmeg. I would buy this beer again, but only when I’m in the mood for an Oktoberfest. Autumn is my favorite season for many reasons, including the excellent seasonal beers offered by many breweries: Oktoberfests, autumn beers, and pumpkin ales. I’ll be reviewing many of these, I hope, in the coming weeks. Speaking of pumpkin ales, the gold standard for my taste is Buffalo Bill’s Pumpkin Ale. However, I’ve sought a six-pack of this liquid nirvana at BevMo, Ralphs, Vons, and Cost Plus with no luck. Has anyone out there found this beer at a San Diego-area store? If so, please leave me a note in the comments.